March 27, 1999—The Harvard women's ice-hockey team win the national championship. 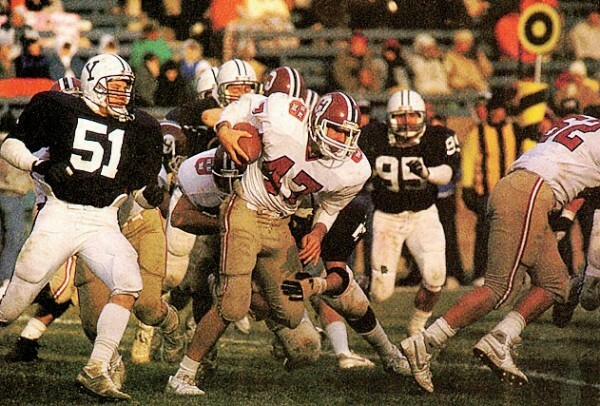 November 21,1987—Harvard beats Yale in a 14-10 cliffhanger to take the Ivy League title. 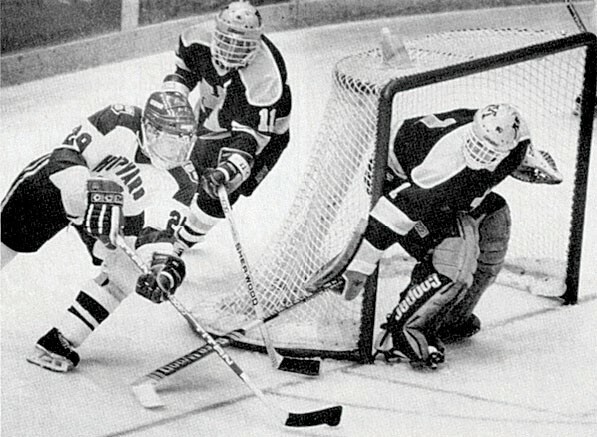 April 1, 1989—The men's hockey team captures an NCAA championship. May 20, 1990—The women's lacrosse team comes from behind to win the NCAA championship. In 1986 Charlotte “Char” Joslin ’90, M.B.A. ’95, was a freshman at Radcliffe College. Joslin is still around, but Radcliffe College is not, nor is an athletic archetype that Joslin represented: the three-letter woman. She played varsity in three sports at Harvard, lettering all four years in field hockey, ice hockey, and lacrosse. Joslin was in all likelihood the last of the three-sport Mohicans. College teams now recruit specialists, athletes who find not only their sport but their role within it—say, soccer forward—at earlier and earlier ages. Specialization was under way even in 1986 (see “The Professionalization of Ivy League Sports,” September-October 1997, page 36), but it is only one of the many changes that have rippled through athletics. With specialization comes the opportunity to spend all 12 months training for one sport, in-season and off-season both. Intense, high-level competition, much of it on club teams, has filtered down to ever-younger cohorts; adult training and coaching also kicks in earlier. The result is better-conditioned, more skillful, and less versatile college athletes than in years past (See “25 high moments in Harvard athletics”). Those players are more heavily recruited than ever, and come from all over the world, especially in international sports like soccer, tennis, basketball, squash, and rowing. Approximately 20 percent of undergraduates now play on the teams that Harvard fields in 41 varsity sports—the most of any college. Add to this the participants in intramural athletics and club sports, of which there are 51, plus those who exercise for recreational and fitness reasons—the Malkin, Hemenway, and Murr gyms buzz constantly—and by some estimates nearly 80 percent of the College leads the vigorous life. Several sports where Harvard has had a long record of success have stayed at or near the top of collegiate rankings—men’s heavyweight and lightweight crew, women’s basketball and squash, tennis, football, and swimming and diving. Other once-dominant programs have become part of the pack, including men’s squash and ice hockey. In still other instances, Crimson squads have risen from humble records to great ones, as with men’s and women’s fencing, which won a national title in 2006; wrestling, which has produced national champions Jesse Jantzen ’04 and J.P. O’Connor ’10; and men’s basketball, where coach Tommy Amaker’s team last year shared the Crimson’s first Ivy title (with Princeton). 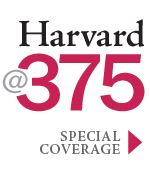 Four Harvard teams have won NCAA championships, and all four have come since 1986: men’s ice hockey in 1989, women’s lacrosse in 1990, women’s rowing in 2003, and the coed fencing title of 2006. Harvard has also won many national championships in non-NCAA sports like men’s rowing; women’s squash was the most recent one, in 2010. These athletes deploy their skills in a changed physical plant. The department of athletics and its coaches moved to the newly opened Murr Center in 1998; in retrospect, it is hard to believe that the department once operated out of a square brick building at 60 JFK Street, or that the three Palmer-Dixon courts were the only indoor tennis venues at Harvard, which now has six courts at Murr, along with a bank of new, international-size squash courts. The Stadium’s playing field has been changed to artificial turf, making it possible to inflate a bubble enclosure there each winter and get far more sportive use from that space. New lights atop the Stadium also enable nighttime football games, as well as after-dark contests in other sports. The illuminated, artificial-turf Soldiers Field Soccer Stadium welcomes nighttime practice sessions and games as well, an accommodation prompted by the nocturnal habits of current undergraduates. If Char Joslin were a freshman today, she would still, no doubt, become a star athlete, but her star would shine in a different sky, with some new constellations.